Cult Crazy 4 Scott Pilgrim! A new cult painting is done! 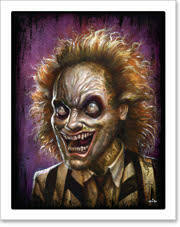 This one is for the 5th Annual Crazy 4 Cult show at the Gallery 1988 Melrose location. They’ve put on four previous amazing Cult shows and this one looks to be the best one yet. As always, I’m super honored to be included in the roster, and I’m pretty pleased with what I contributed. The painting is based off a relatively newer movie: Scott Pilgrim vs. the World. I guess we’ll have to let historians decide if it ultimately can live up to its early “cult” status. I immediately fell in love with this flick, as it so cries out to so many video games that I cherished in my youth. Excellently well done, I encourage a rental today, especially if you’re a fellow child of the 80s. Ink and acrylic on paper, mounted to wood panel, resined. The opening reception will be Friday, July 8th, from 7 to 11PM. I’ll be there to say hello, ramble about art and pop culture and pose terribly for photos if you want. My buddy Andrew Wilson‘s amazing digital painting was featured for the card. Go check out his work right now! Full show details below. New Bill Murray Print Release! Man, this has been the month of print releases. Prints of my painting “Wisdom of the Llama” will be released through Gallery:1988 Monday, June 27. The limited print edition number is 76, which coincides with Bill Murray’s rise to stardom in 1976, when he was cast on SNL. The prints are available for, you guessed it, $76 each. Each print is hand signed, titled and numbered and available through G1988’s online store. For an extra special treat, prints number one and two have been mounted and resined all glossy and smooth like the original painting, for your ocular pleasure. These super-ultra-mega limited mounted prints will both be available for $200 each. Also, there are still several prints left of both “Down the Rabbit Hole” and “Hysteria” in the shop. Thanks as always for the support! There was such positive response to the American McGee’s Alice: Madness Returns painting, that I decided to do a limited print release. The painting sold rather quickly, which is always a bonus, and many of you personally requested prints. So I’m here to deliver. The prints are on the same paper and same page size as the Down The Rabbit Hole prints, (of which there are a few left) and is a slightly larger image area. The edition size is still rather small: only 25 will be made, hand signed and numbered. I’m super pleased with the quality of both prints so far and hope you’ve been enjoying them as well. If interest continues, I plan on releasing more prints throughout the year, and hopefully get on a regular schedule to make more art available for everyone at an affordable price. I realize not everyone can drop a thousand dollars or more, but I’ve always believed art should be accessible to anyone. Hopefully this is another step along that path. One minor note- I’ve had to up my shipping costs outside the U.S., due to increasing costs and my desire to keep my production and service as professional as I can. Apologies if this is an inconvenience, and hopefully it isn’t a deal breaker! Here’s a little more technical info on the prints: limited edition high-quality archival giclee print on 140 lb. (300 gsm) Entrada Rag Bright White acid-free 100% cotton. The image size is 12″ x 17.75″, printed on a 13″ x 19″ sheet. Only 25 will be made, and each print is hand signed and numbered. Each print is shipped flat. All prices include domestic shipping. To purchase a print, head on over to the store here.